I am one of those campers that really love to carry items that are multipurpose. While you may think that a simple Mylar blanket can only be used for one purpose, you would be very mistaken. Below are the top 5 unique uses I have found for the simple survival blanket. Clothing-Believe it or not, Mylar blankets make great clothing. Consider cutting a hole in the center of the blanket to make a poncho, which can be worn inside a coat or outside. Also, use the survival blanket as a warming liner for your hat, shoes or boots. The same principle can be applied to your sleeping bag. To add an additional layer of warmth, wrap yourself in the survival blanket before climbing inside your sleeping bag. Fire Reflector-Many people have heard about stacking stones on the backside of your fire to reflect the heat back onto you. The same principle can be used with a Mylar blanket. But when using this technique, make sure that it is not too close to the fire and that it is securely attached to a tree or rocks. If this is not done, the Mylar blanket can easily catch on fire. Water Collector-There are times when you really do not want to have to pull out the water purifier for a simple drink. While you do not want to drink water from a stream that is not purified, there is an alternative if you can wait on your drink. When using this approach, you have several different techniques. The goal is to collect dew off plant material. 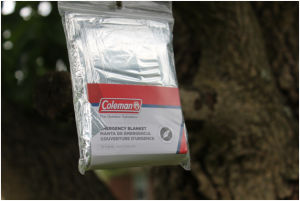 This can be done by either hanging the survival blanket underneath plant material or create a depression in the soil underneath the plant material. Once that is done, line the depression with the Mylar blanket. In a few hours, you will find a little water on the Mylar blanket. There is one cautionary tale though when using this approach. Be careful where you set up the survival blanket. Do not place it where animal feces are found or under plant material that is poisonous. Clothes Dryer-A Mylar blanket is a great thing to have when you want to speed up the drying process of your clothes. While this technique is not equal to a dryer, it does work well especially when the weather is cool. To do this, simply lay out your survival blanket in the sun. Top the blanket with your damp clothes that have been wrung out as much as possible. In a few hours, check your clothes for dryness. If not completely dry, adjust accordingly. Shelter-In an emergency, a survival blanket can easily be turned into a shelter. This will keep the weather off of you and if needed can signal for help.